We're halfway through the week and we have the perfect little pick-me-up to keep your creativity flowing! The First Blush Block of the Month book is the latest release from It's Sew Emma, and features the Starburst Ruler by Creative Grids! The pages of this book are bursting with adorable projects that are just waiting to be brought to life! 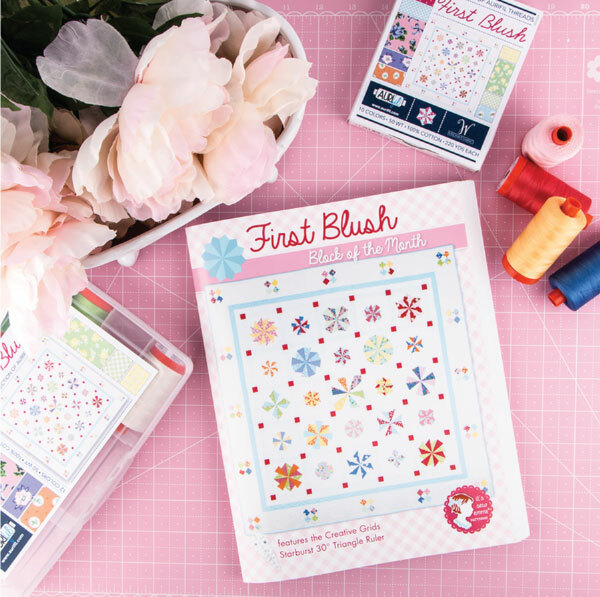 If you've already got your hands on the First Blush book and are quilting away, share your progress with us on social media! We love seeing your projects! Congratulations to the winner from last week's Sneak Peek feature: Jeannine (scrappymommy2) for her review on The Jolly Bar Book! Leave a review of your favorite book that Fat Quarter Shop carries on our book page to be entered to win a book of your choice! The winner will be announced Wednesday, November 2 on our next sneak peek feature!